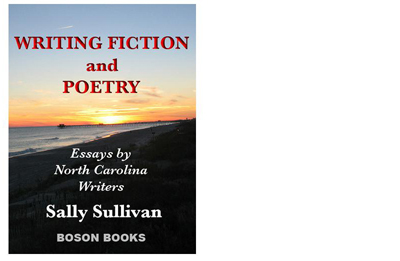 Only for the month of July, Sally Sullivan’s “Writing Fiction and Poetry” is available for $0.99 on Amazon. Sally Sullivan writes and teaches at the University of North Carolina-Wilmington. She has published poetry, fiction, and two textbooks on rhetoric. She received her Ph.D. from the University of North Carolina-Greensboro. Writing Fiction and Poetry is a collection of essays by twelve North Carolina writers. The essayists, six poets and six fiction writers, focus on a discussion of their writing processes with an emphasis on revision. Preceding each essay is a biographical sketch and following each is an interview with the writer. The writers are: Fred Chappell; Elizabeth Cox; Candace Flynt; Jill McCorkle; Tim McLaurin; Robert Watson; Betty Adcock; James Applewhite; Kathryn Stripling Byer; Michael McFee; Heather Ross Miller; Shelby Stephenson. A great collection for writers and aspiring writers! What i don’t realize is actually how you’re not really much more well-liked than you may be right now. You are so intelligent. You realize therefore significantly relating to this subject, made me personally consider it from numerous varied angles. Its like women and men aren’t fascinated unless it is one thing to do with Lady gaga! Your own stuffs great. Always maintain it up!